Great people make great companies, and good employees are the biggest strength of any organization. Recruiting and retaining these employees is a continuous endeavor, which requires investments in terms of time, money and effort. Despite high unemployment rates, it is at times difficult to find the candidates with right qualifications and qualities to fill a position. Recruiters are always looking for newer and better ways to hire the right talent, and to make their hiring more effective, they need to develop new recruitment strategies covering wider channels. Ascendance of professional and casual social media sites with hundreds and millions of users worldwide has enabled corporates to use these networks as recruiting tools to research and reach out to potential candidates. 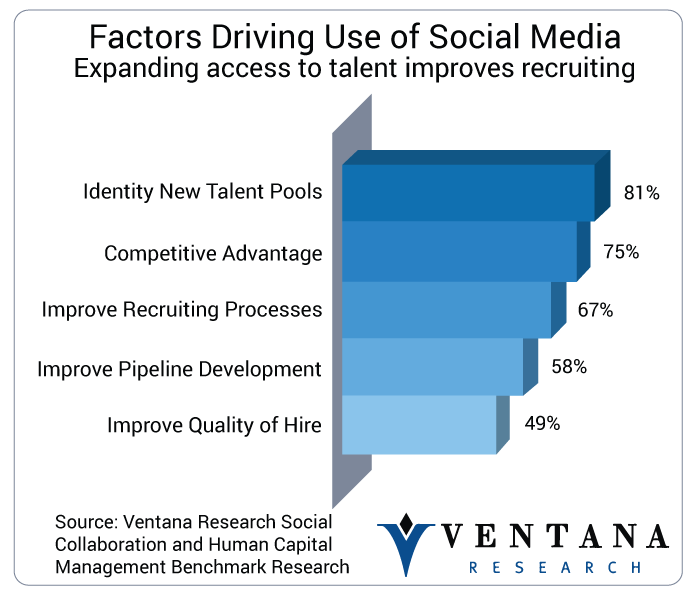 Since 2011, use of social media for recruitment has seen a tremendous growth which offers unprecedented access to large number of candidates, and reach out to them directly. 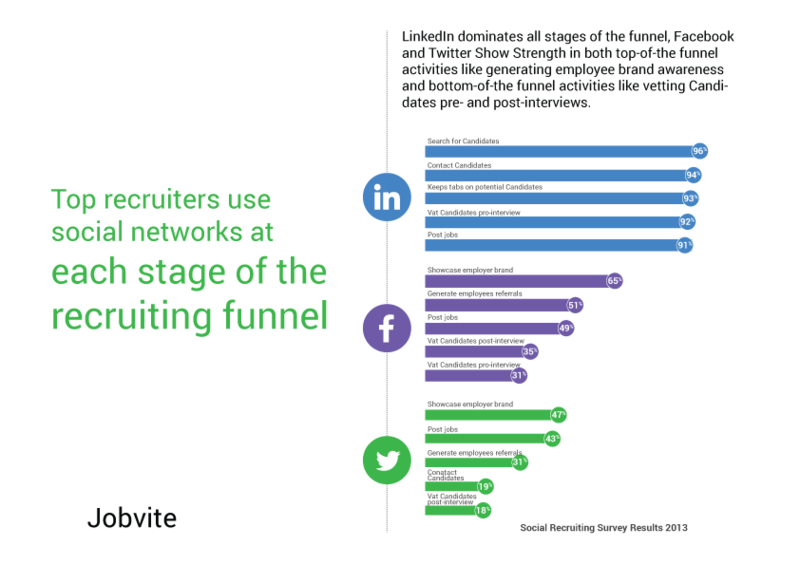 As per Jobvite’s 2014 social recruiting survey covering 1,855 recruiters, a whopping 93% use or plan to use social media as part of their recruitment strategy. 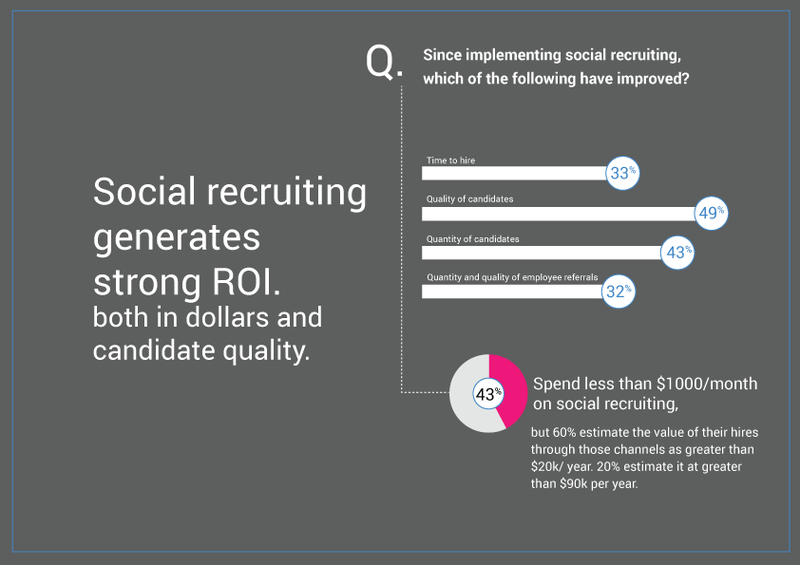 Respondents also stated that the use of social media improves the quality of candidates by 44% as compared to using only traditional hiring techniques such as filtering resumes and phone screening solely based on the experience and skills. The key to success in social recruitment is to know where to find the right people. Recruiters have already nailed big three of social media: Facebook, Twitter and LinkedIn, and these have been extensively mined for hiring quality talent due to their large user base. As seen in the charts above, the social networks are being extensively used by the employers at each stage of recruitment, However, companies need to keep in mind that it is a two way lane, and candidates are looking at them as well. Moving beyond LinkedIn, Facebook and Twitter, companies can use several unconventional technologies and platforms to make their mark on the net and gain more visibility to attract more talent. These different platforms are an inexpensive way to create exceptionally targeted ads, and focus on the specified audiences based on location, ages, gender and even keywords. The employer brand can be reached out to a much larger audience, and by helping candidates understand what it’s like to work in your company, it is easier to create a pipeline of the talent pool, even before the job opening is posted. Video Hubs– You Tube has more than a billion users, and companies can use this channel to embed video clips of their company, giving a glimpse of what employees can expect. The video should be entertaining and engaging, and this can help build a good company brand. SlideShare– It focuses on the professional content, and can be used to target more relevant group of users. Pinterest – It is an online pinboard for sharing graphics, images and other information, and is growing at a rapid rate. Companies can use the visual coverage to showcase their USP and build a strong brand image. On the other hand, social media can be used by the hiring managers to gauge what an individual is like prior to time consuming process of application review and scanning. These channels can be used to get a better glimpse into the values, lifestyle and cultural fit of the candidate, which is critical information not only for recruitment, but also in engaging employees and increase the rate of retention. Quora – An organized question-answer forum, edited and monitored by the users, and can be effectively used for hiring. Quora enables employers to take a deeper look into the potential candidates in terms of reflective experience and competitive intelligence. It is an easy medium to gauge the experience, knowledge and conceptual thinking ability of the candidates on any given topic. Quora is also an effective channel to follow the passive candidates. Google+ – Can be used by the employers to add candidates to their circles. The circles can be categorized, and recruiters can contact or follow them publicly or privately as per the set preferences. Dribbble – Used by all kinds of designers to showcase their projects, works and processes. Quora was not designed for recruiting and sourcing use, however, Dribbble has been designed just for that, to generate leads for the designers. If you like any candidate, you can follow them on other channels too. Github– A niche site for powerful collaboration, all things code, mainly for developers and coders. Employers can get a glimpse of the code, insights and reviews to get the idea of candidate’s work. FourSquare – Not built for recruiters, however, can definitely be used to get some additional information. This tool provides a good way to interact with the candidates on a more personal level to know their personal interests and preferences, and see if they match with those of the organization. With all these new tools and platforms, the world is becoming more technologically driven, and social networking is bridging the gap between candidates and recruiters. However, just like any other technology, use of social media for recruitment has its own set of dos and don’ts. Recruitment through social media is a new phenomenon, and as of now, it is difficult to gauge the breadth of pitfalls. Companies have to be very careful with the information acquired from the internet about the candidate, and information must be verified to avoid liability. Misuse of the information can lead to unintentional discrimination or infringement of privacy. Social media groups are only as good as the efforts put into them, and companies need to participate and take time to develop and become integral part of the communities by being consistent. 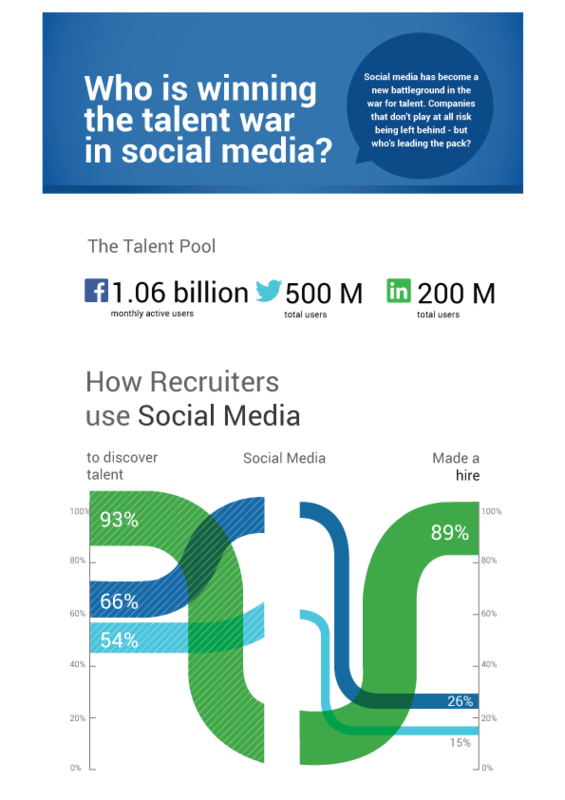 Keep in mind that social media is just another tool, and not a complete solution to recruitment. These are easy to use tools, with endless possibilities. Interact, share, comment, follow, do whatever it takes to strike a deal.